This is the beginning of my valiant effort to resume blogging. I don't really have a ton to blog about, but here goes anyways. About a month ago, I made an impromptu trip to the East Coast to visit with my family out there, as well as attend a funeral. My sweetest sister in law ever even said we could have Michael's 3rd Birthday party while I was out there, too! The week was jam packed full of playing, snuggling, laughing, chasing, dancing, and being the silliest little auntie and nephew/niece we could be. Alas, picture taking was not our first priority, so only the following two pictures came about. The kid is a ton of fun. 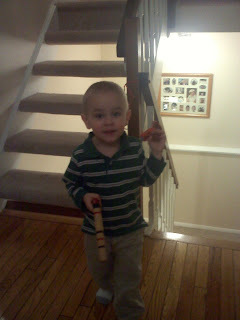 This was my valiant effort to show Christian that he was having fun with the toys that we got him. However, I think that the fact that I could hardly get him to sit still to take a picture while he played is more proof that he liked them. Seriously? Could YOU ever say "no" to him?! I think not! This little stud of a boy got to come along on a fabric store trip with us, and what a trooper! 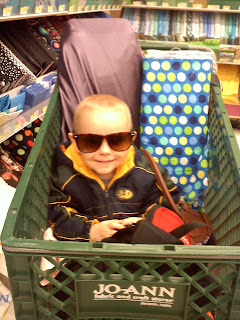 He got to sit in the cart and play with Aunt Lisa's purse! Lucky dog. I look away for a second, and he had found my glasses, and was rockin' them like it was no big deal. Hannah was sweet enough to let me sit in on a picture or two of the kids while they got their 3 year (Michael) and 6 month (Amy) pictures done. Those little gems are soon to follow. Don't you fret, my little pets. Okay, why is there something from photobucket showing up on your blog...covering pictures!! Also, why can't I click on a picture to make it big like I can with other people's blog??? Pictures of Michael and Amy MUST....BE.....MADE...... BIGGER!!!! I guess the background that I had on my blog is gone now, so I have that stupid thing on the back. but Hannah is the smart one with blogger, and I don't know how to change it! As far as making the pictures bigger.. no idea why mine arent. Lame.